Good social responsibility requires our personal engagement – because it helps to grow people differently – Go India, go future! 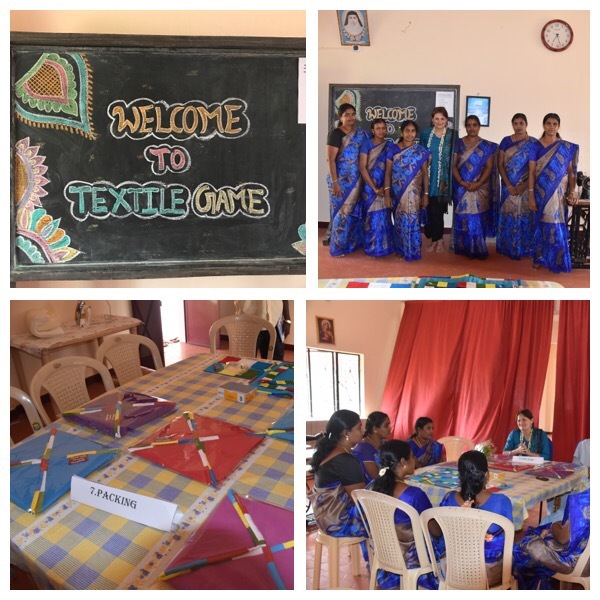 The first game tailoring training started one year ago. The women were keen to learn but they were a little scared whether they could make it or not. Hand embroidery, working on a more complex design, knowing that they were expected to deliver good quality products … it was not that easy at the beginning to get organized and to form the group, to learn the skills and to be courageous enough to try out. For everyone involved in the project. But it was worth every single step. Today we have a small ceremony because what these women have achieved is a lot. It is amazing. It is more than what was expected at the beginning of the project. They have produced more than 250 games already, but besides these numbers they have gained much more on a personal level, skills that are changing their way of life. With pride they wear now their group Sari which they have designed and tailored for themselves. The are all mothers and work on a daily basis some hours to produce these games. In this way they have a small, but continuous income that means much to them and their families. Most of them use the money and invest it in their children’s education, school fees and books. But they are also more respected now within their families. Definitely, they have become more self-confident. The times before when we met they just wanted to do their best, but they always waited for exact details how to design our games. This time, it was the first time that they came up with proposals on what could be designed differently; they asked if they could use different design pattern and colors and they would like to develop and realize it, too. It’s an enormous step – even it might seem to be a small one for whom is used to decide and to come up with own proposals. I’m happy to see this development. We use this games with knowledge cards on different topics, be it for leadership programs in India for business manager, be it for some local. health awareness trainings. It would have been easy to ask professionals to produce these games. It just requested a little more of effort to make a change happen in the life of these ladies. Some Corporates who run CSR projects could easily include such activities in close collaboration with NGOs. It jjist request some personal engagement. If someone is interested in the game or different educational card sets (nutrition, basic knowledge about it), please feel free to contact.